LSIA has continued its investigation into Phaeton Health Group’s opioid treatment across the street from Linthicum Elementary since the publication of last month’s article. Unfortunately, we do not have much good news to report. The County Executive’s office will not take any action against Phaeton Health Group and has closed its investigation. This article provides the County Executive Office’s explanation as to why it will not take any action, along with the reasons why LSIA believes that the County’s decision is wrong. To be clear, LSIA does not oppose opioid treatment facilities. LSIA agrees that such treatment is necessary for our community and most communities nationwide. However, we do oppose the placement of such walk-in outpatient treatment facilities across the street from our schools, especially where the location is in violation of the law. LSIA received documents from the Office of Planning and Zoning pursuant to our Public Information Act (PIA) request for pertinent documents related to the County’s investigation into Phaeton Health Group. The County confirmed that it provided “all records and communication between Phaeton Health Group and the Anne Arundel County Office of Planning and Zoning.” According to the Public Information Act Officer, the only documents that were not provided were two email communications between the Office of Planning and Zoning and the Office of Law. The emails were not shared, according to the PIA Officer, because of attorney-client privilege. Based on the documentation in the file, the County’s investigation appears to have consisted of police surveillance outside of the building, internet searches, and asking Phaeton Health Group what its business consists of. Since Phaeton Health Group denied conducting the business that was stated in its advertisement, the County has taken the position that their word is good enough since it provided the County with an updated advertisement that purported to modify its business from only opioid treatment to just some opioid treatment. Notably, Phaeton Health Group appears to be no longer listed on www.suboxone-directory.com as providing Suboxone treatment, which is a positive step. However, Phaeton Health is still listed on other websites as a Suboxone provider. For example, its doctors are registered as Suboxone doctors on medicallyassisted.com, with address and phone number for the provision of Suboxone treatment. County Executive Schuh’s office reengaged with LSIA following the publication of LSIA’s Phaeton Health Group article on May 2. The reengagement occurred because a number of our community members contacted Schuh’s office and demanded that they provide answers as to why Phaeton Health Group was still operating across the street from Linthicum Elementary. On April 19, County Executive Schuh’s office had previously instructed LSIA, via email, that it would not answer our questions about their investigation into Phaeton Health and that LSIA should contact the Office of Zoning Enforcement and Phaeton Health itself for further questions. I mention these facts to highlight the importance of community engagement: every phone call and every letter makes a difference. Without the support from our community and our membership, we would not have the information that we have today. The County further explained that it could not find any violations by Phaeton Health Group and that “[t]he investigation was conducted and is now closed.” LSIA asked the County to explain why it believes that advertising opioid treatment and prescribing Suboxone did not qualify Phaeton Health as a State Licensed Medical Clinic. LSIA also asked the County to describe the definition it used to determine whether a business is a State Licensed Medical Clinic since our reading of the law indicates that prescribing Suboxone and advertising opioid treatment clearly qualifies Phaeton Health as a State Licensed Medical Clinic under the County and related state law. The County law prohibiting State Licensed Medical Clinics paints a broad prohibition and, as the County itself reports (see quote directly above), the state had issued waivers for the business to prescribe Suboxone and the state licensed physicians were in fact prescribing the opioid treatment drug. On May 10, LSIA leadership and other community leaders attended a small event held by County Executive Schuh called “County Executive Steve Schuh for Coffee and Conversation” at Italia’s Corner Café. LSIA discussed Phaeton Health Group with Mr. Schuh, including LSIA’s frustration that all of Phaeton Health Group’s advertising in the community was directly related to opioid treatment and that it is apparent to us that Phaeton Health is violating County Law by operating across the street from Linthicum Elementary. Additionally, we reminded Mr. Schuh that he had previously told LSIA and about 200 other people that Phaeton Health was in an inappropriate location and that it would be removed because of their violations of the law. In spite of his statements, the County did the opposite and issued a permit to Phaeton Health to operate. Mr. Schuh’s staff stated that the County is allowing Phaeton Health to operate in its location because they are only prescribing Suboxone but are not distributing it out of their office. LSIA explained that the law clearly prohibits the advertising and prescribing of opioid treatment—whether the business is prescribing or dispensing is not dispositive of the issue. Councilman Smith was also present at the meeting. He agreed with LSIA that the business is violating the law and asked Mr. Schuh for “a stop order on running the business” while a law suit is straightened out. Mr. Schuh was not sure about what the law directs and promised that his office would look at the law to see if the business can operate. He promised that his office would also look to see if the doctors are licensed and would contact the health department. Following the meeting, LSIA sent County Executive Schuh’s office the relevant portions of the County Law that pertain to the prohibition of Phaeton Health in its present location. LSIA sees no possible interpretation of the law that would not prohibit Phaeton Health's activities in its location—whether Suboxone is being prescribed, distributed or both does not resolve the analysis. LSIA requested that the County pursue legal action, if necessary, to ensure that the business does not continue to operate in violation of County law. County Executive Schuh’s office responded on May 14 with an email stating that the Office of Law considered the evidence from various agencies and decided that they were not able to pursue a zoning case. The County’s explanation begins by saying that “writing prescriptions for Suboxone is technically not the equivalent of operating a state-licensed drug treatment clinic, the type of entity barred in County code from operating within 1000 feet of schools, etc.” I need to note here that this is an incorrect statement of the law. The County law does not bar a “state-licensed drug treatment clinic,” it bars a “state-licensed medical clinic.” This wording is important because the County seems to be attempting to narrow the scope of the County law in its explanation and does not cite any the important legal terms from the law. The County went on to explain that “Methadone clinics ARE state licensed entities as therefore must comply with the County set-backs. Methadone clinics hold a specific State clinic license and they bill as clinic entities, not as individual providers. Phaeton is not a licensed clinic or medical facility. It is a group practice of physicians— comparable to several hundred other medical practices located all over the County.” Again, the County is narrowing the scope of the law and obfuscating the actual wording here in order for its conclusion to make sense. The County law bars “state-licensed medical clinic[s]” according to a very specific definition contained within the County law. The prohibition includes “any individual or organization that provides treatment, care, or rehabilitation for individuals who show the effects of drug abuse or alcohol abuse, and represents or advertises itself as an alcohol abuse or drug abuse treatment program…[including]...A health professional licensed under the Health Occupations Article who is treating patients within the scope of the professional’s practice and who does not advertise the practice as an alcohol abuse or drug abuse program.” Nowhere in the County’s explanation does it mention the actual legal definition of a State Licensed Medical Clinic – it is simply making conclusory statements without explanation. Clearly, Phaeton Health Group is providing treatment for individuals who show the effects of drug abuse, and advertises itself as a drug abuse treatment facility. These are simply the objective and demonstrated facts. The County then contradicts its own explanation by stating that “The physicians hold valid individual physician licenses and are also licensed by the State and DEA to prescribe scheduled drugs inc [sic] Suboxone.” This portion of the County’s explanation actually states that the physicians are licensed by the state to prescribe suboxone, which appears to be the portion of the law that the County denies is applicable Phaeton Health. Since the County has made it clear that it does not intend to challenge Phaeton Health Group’s activities in Linthicum and will not continue to investigate the business, the community is charged with continuing to monitor the business to ensure that it engages in safe business practices. The County has refused to enforce County law as LSIA and other elected representatives have requested. LSIA will continue to attempt to contact Phaeton Health Group’s owners with the hope that they will discuss their business with us. LSIA will also continue to search for other solutions to this issue. In the meantime, if you care about this issue, please contact our County representatives (contact information below). You can also file reports of zoning violations with the Office of Planning and Zoning. If you see something or have any comments about this issue, please also let LSIA know about it. (MD Health-Gen Code §8-401 (2015)) [emphasis added]. Phaeton Health still has not returned LSIA’s phone calls or messages to discuss its business. The relevant text from the County law and state law are included at the end of this article for reference. BWI Roundtable Noise Update: We need your help! Lawmakers are voting at the end of May. 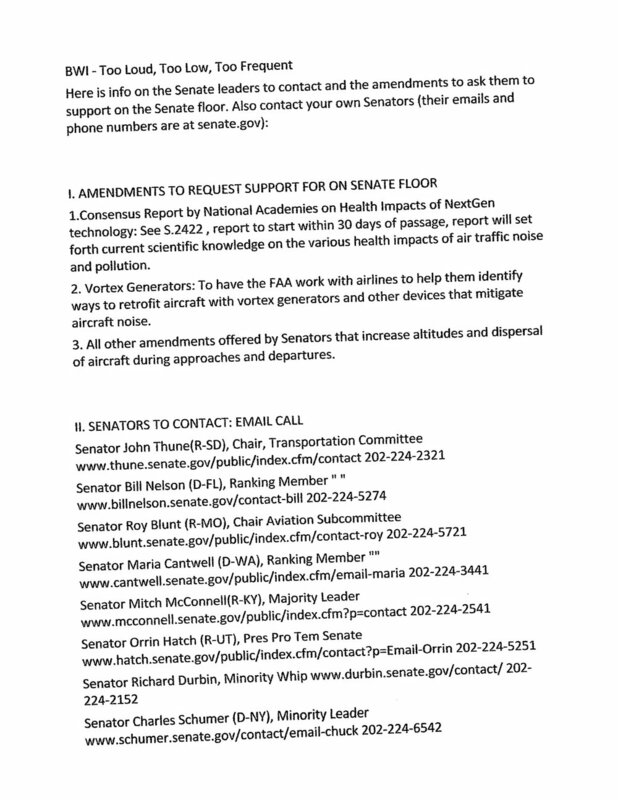 Please read through, do your research and contact the lawmakers listed here. Thank You. At our May meeting, the members present elected the Board of Directors for 2018-19. These individuals will begin their terms in June. At our May meeting the budget was presented by the Board of Directors and approved by the Membership. LSIA first learned about the existence of Phaeton Health Group, LLC on October 9, 2017. A concerned Linthicum resident reported to LSIA that a business was advertising opioid treatment and “has been opened for about 4-6 months in Linthicum.” It quickly became apparent to LSIA that Phaeton Health Group either planned to or had already been prescribing and/or administering suboxone (an alternative to Methadone) at a location across from the Stavlas Shopping Center. Once the basic facts of this report were substantiated, LSIA immediately contacted our local elected representatives and County zoning enforcement to report the suspected illegal activity. Anne Arundel County zoning enforcement indicated that it was not aware of the clinic until LSIA reported it. LSIA held its monthly meeting in the Lindale Middle School auditorium just two days later. During this meeting, Councilman Smith reported that he had co-sponsored Bill No. 14-15 in the County Council in 2015 that prohibits "state licensed medical clinics" within 1,000 feet of schools or dwellings. This bill was ultimately passed into law and prohibits a state licensed medical clinic from Phaeton Health’s location. Phaeton Health Group is directly adjacent to residences, the light rail and, of course, Linthicum Elementary School. County Executive Schuh was also in attendance at the LSIA meeting on October 11. He shared Councilman Smith’s view that Phaeton Health was “in an inappropriate location,” should not be close to homes or schools and that the law is clearly against the clinic getting a permit so it will need to find a new location. He went on to explain that his office believes that the clinic opened without the knowledge of the County, and without a permit. Furthermore, he explained, the clinic does not have County authorization to operate. County Executive Schuh concluded that Phaeton Heath did not receive the required permits and was not conforming to the law described above. We were advised that the County would send an injunction to the business to stop operating and that it would not be able to remain in its current location. Numerous attempts to reach Phaeton Health Group to ask questions and gain their perspective about their business (including phone calls, website inquiries and site visits) have all gone unanswered. An investigation was undertaken by Anne Arundel County zoning enforcement and Anne Arundel County Police to gather all evidence of Phaeton Health Group’s potential illegal activities. The County zoning enforcement office first sent Phaeton Health Group a notice of non-compliance, stating that the business is less than 1,000 feet from a school, less than 1,000 feet from residences and there is not a “no loitering” sign as required in the code. The County gave Phaeton Health until November 1 to come within compliance. On November 29, 2017, during a meeting that Councilman Smith held at Lindale Middle School, Councilman Smith reported that County Inspections and Permits has put the clinic into surveillance. Surveillance has shown that the clinic has been closed during the day. There was a report that someone went there in the evening and there have been reports that four or five people have gone to the suboxone clinic after hours. Furthermore, Councilman Smith reported that the investigation will be wrapped up shortly and that outpatient medical clinics are not permitted in this location. The County conducted site inspections and interviews, including at least one interview with “one of the doctors who owns the clinic.” The doctor denied running a “state licensed medical clinic” as is prohibited by the County code. Phaeton Health was instructed to provide proof that they are not a state licensed medical clinic. Phaeton Health ultimately continued to deny that it is providing opioid treatment in violation of the law. Instead, Phaeton Health now purports that it is merely a consulting business, notwithstanding all of the written evidence and statement from at least one witness with personal knowledge to the contrary. The Anne Arundel County Office of Planning & Zoning submitted the results of its investigation to the County Office of Law in November, 2017. LSIA received notification in February from the Office of Planning and Zoning that the Office of Law does not believe that there is any evidence that Phaeton Health Group is operating as a suboxone clinic. It’s impossible to determine why the Office of Law came to this conclusion since the County Executive’s office has declined to provide any further explanation, as discussed in more detail below. At this time (February), the County advised LSIA that it needed more time to investigate the Phaeton Health Group. LSIA requested that County Executive Schuh’s office answer some questions regarding the decision to issue Phaeton Health Group a permit instead of enforcing what others believe to be the law. LSIA was referred to the Public Information Officer to answer questions. The Public Information Officer asked LSIA to submit the questions in writing. Ultimately, after several weeks of following up, Executive Schuh’s Constituent Officer finally declined to answer any questions about why the County Code was not enforced, what the Office of Law’s reasoning was, whether Executive Schuh is supportive of this decision, whether the investigation continues and a number of other questions that we raised relating to Phaeton Health Group. I am an attorney who is has been licensed to practice law for ten years. In my reading of the County Code, it is difficult to imagine how Phaeton Health Group would not be regulated by this law, given the broad scope of the prohibition. However, the County Office of Law has determined that it “do[es] not feel that there is enough evidence to proceed with a civil suit at this time.” Since the executive branch of government has declined to provide LSIA with any explanation of how this law does not apply to Phaeton Health Group, we are left only with what we were able to uncover – that Phaeton Health Group was advertising opioid treatment across the street from our elementary school and homes, and that the County provided the business with a permit. It is worth noting that I also sent a Public Information Act (“PIA”) request for pertinent documents related to the Office of Planning and Zoning’s investigation but did not receive the documents in time to review prior to submission of this article for publication. I will update this article when the County Executive’s offices provide me with the information that I am requesting. LSIA plans to continue to push this issue until there is an acceptable resolution. Since the County has refused to act by bringing an appropriate law suit against Phaeton Health Group, we will need to be the eyes and ears for our community. Citizens are able to file reports of zoning violations with the Office of Planning and Zoning. If you oppose the Phaeton Health Group’s location and believe that the Office of Law should enforce the County Code or at least let us know what is going on, let our elected representatives know about it. The Office of Law is under the purview County Executive so his office would be a good place to start. The County Attorney, who heads the Office of Law, is appointed by the County Executive himself. If the County allows this type of business to continue to operate in our neighborhood, this could set a terrible precedent. Title 8, Subtitle 4 of the Health General Article provides that, inter alia, “[t]he administration shall…[p]romote , develop, establish, conduct, certify, and monitor programs for the prevention, treatment, and rehabilitation related to the misuse of alcohol and drugs…” (MD Health-Gen Code §8-401 (2015)) [emphasis added].